THIS LEASE AGREEMENT (this Lease) is made as of _______________, 200_, by and between COMMERCIAL PROPERTY LANDLORD, a ____________ limited partnership (Landlord) and ACCEPTABLE TENANT, a _____________ corporation (Tenant). (a) Allowance: Shall mean an amount equal to ____ Dollars and No Cents ($_.00) per square foot of Tenant's Useable Square Feet in the Premises (as defined in Section 1.01(z) below) which is equal to _______________ Dollars ($________), plus an additional ________________ Dollars ($_________) to be used in space planning for a portion of the Premises located on the ______________ floor. (b) Building: That certain parcel of real estate located within the ____________ Center as described on Exhibit B attached hereto and incorporated herein by this reference and the building and other improvements located thereon, all of which is commonly known as _____________________. (c) Building Core: The area within the outermost finish face of that portion of the Building that incorporates those areas that provide service to the tenants of that floor and to the Building. These areas of service include: restroom facilities for men and women along with the vestibule and access, electrical, mechanical, and telephone rooms, janitor closets, elevators and service elevators along with lobby and stairs, vestibules, and all vertical floor penetrations for mechanical/electrical/plumbing for the Building. (d) Building Shell: The condition of the Building completed with the following improvements: (i) outside walls (not including drywall), core walls, and elevator lobby areas completed to building standard condition for public areas; (ii) unfinished concrete floors throughout the Premises, broom clean; (iii) building standard 110 volt 220 amp. power supplied to the Building Core along with 277/480 volt fluorescent lighting power supplied to the Building Core; (iv) men's and ladies' restroom facilities with building standard finished located on each floor on which the Premises are located; (v) building standard voice communication speakers and smoke detectors in accordance with applicable building codes and provided only at the core; and (vi) mechanical, electrical, plumbing, life safety, heating, air conditioning and ventilation in Building Core area as required to connect to and service the Premises. (e) Commencement Date shall mean _________, 200_. (f) Common Building Areas: All areas and facilities outside the Premises and within the exterior boundary line of the Building and interior utility raceways within the Premises that are provided and designated by the Landlord from time to time for the general non-exclusive use of Landlord, Tenant and other tenants of the Building and their respective employees, suppliers, shippers, customers, contractors and invitees, including, without limitation, trash areas, roadways, sidewalks, walkways, landscaped areas, irrigation systems, lighting facilities, fences, gates, elevators, roof, common entrances, common areas within the Building, common pipes, conduits, wires and appurtenant equipment serving the Premises, exterior signs, Tenant directories, fire detection systems, sprinkler systems, security systems, and the parking facilities for the Building. Landlord has the right to change the Common Building Areas and to take other actions respecting these areas in accordance with Section 2.05 below. (g) Declaration: Those certain Covenants, Conditions and Restrictions for The Crossing Business Center dated ____________, 199_ and filed for record with the County Recorder of _______ County, ____________ , as amended from time to time. (h) Expense Stop: The amount (per square foot of Tenant's Rentable Square Feet) Landlord herewith agrees to expend as its share of Standard Operating Costs and Variable Operating Expenses (which shall be a credit for Tenant to apply to offset Standard Operating Costs and Variable Operating Expenses charged to Tenant) shall be _______________ Dollars ($_____). (i) Initial Security Deposit: ______________________ Dollars ($________) to be held as required under Section 4.10 of the Lease. (j) Laws: All applicable statutes, regulations, requirements, ordinances and orders promulgated by any federal, state, local or regional governmental authority whether prior to or following the Commencement Date of this Lease. (k) Landlord's Address: ______________________. ________________________________. (m) Lease Interest Rate: The lesser of (i) two percentage points (2%) over that fluctuating rate of interest announced from time to time by the Bank of America National Trust and Savings Association as its prime or reference commercial lending rate of interest (Prime Rate) (or in the event such bank is no longer announcing such rate, by such other federally regulated banking institution of comparable stature as Landlord shall reasonably determine), or (ii) the maximum interest rate permitted by law. (n) Lease Term: five (5) years and six (6) months beginning on the Commencement Date and continuing until sixty-six (66) months after the first day of the first full month following the Commencement Date, unless extended pursuant to Rider No. 2 - Option to Renew Lease attached to this Lease and incorporated herein by this reference. (o) Leased Premises Address: ___________________ . (p) Mortgagee: Shall mean the mortgagee or beneficiary under a deed of trust holding a lien encumbering the Building or any holder of a ground leasehold interest in the Building or any part thereof. 31. Any other expenses which, in accordance with generally accepted accounting principles, consistently applied, would not normally be treated as an Standard Operating Expense by landlords of comparable buildings. 32. Any Variable Operating Expenses (as defined in Section 1.01(bb). It is understood that Standard Operating Costs shall be reduced by all cash discounts, trade discounts, or quantity discounts actually received by Landlord or Landlord's managing agent in the purchase of any goods, utilities, or services in connection with the operation of the Building. In the calculation of any expenses hereunder, it is understood that no expense shall be charged more than once. Landlord shall use commercial reasonable efforts to effect an equitable proration of bills for services rendered to the Building and to any other property owned by Landlord. (r) Permitted Uses: General office use, including, but not limited to, a call center facility operated on a twenty-four (24) hour per day basis, three hundred sixty-five (365) days per year. (s) Premises: The office space in the approximate location within the Building as indicated on Exhibit A attached hereto and incorporated herein by this reference. (vi) reasonable legal and other professional fees, costs and disbursements incurred in connection with proceedings to contest, determine or reduce Real Property Taxes. Real Property Taxes shall not include successor transfer taxes (except as provided in Section 1.01 (t) (iv) above, federal or state income, franchise, inheritance or estate taxes of Landlord or any of the parties which comprise Landlord. (u) Rentable Square Feet in the Building: Seventy-four thousand five hundred sixty-six (74,566) rentable square feet. The Building is stipulated for all purposes to contain said Rentable Square Feet in the Building. (y) Tenant's Rentable Square Feet: _______________________________ (________) rentable square feet. The Premises are stipulated for all purposes to contain said Tenant's Rentable Square Feet. (z) Tenant's Usable Square Feet: ___________________ (_______) usable square feet. The Premises are stipulated for all purposes to contain said Tenant's Usable Square Feet. (aa) Commencement Memorandum shall mean a document similar to Exhibit D attached hereto. The Commencement Memorandum, among other things, shall contain a reference to the Rentable Area of the Premises and Useable Area of the Premises. Tenant agrees that the Rentable Area and Useable Area of the Premises stated in the Commencement Memorandum shall be binding throughout the Lease Term. (bb) Variable Operating Expenses: All costs of any kind paid or incurred by Landlord in connection with the management, maintenance, repair, replacement or operation of the of the Building (which does decrease or increase as a result of Tenant's use of the Premises) including by way of illustration but not limitation all of the following: (i) utilities, water, waste disposal, janitorial and refuse removal and all other utilities and services provided to the Building, (ii) repairs and supplies, and (iii) all other costs that will increase (or decrease) as a result of a tenant's use of the Premises. Tenant's share shall be Tenant's Adjusted Share (as defined below). (cc) Tenant's Adjusted Share: Tenant's Adjusted Share shall be equal to a fraction where the numerator is Tenant's Adjusted Rentable Square Feet (as defined below) and the denominator is the Adjusted Rentable Square Feet in the Building (as defined below). The Tenant's Adjusted Share shall be determined by Landlord each quarter of each calendar year utilizing the method described herein. It is stipulated that Tenant shall use the Building systems twenty-four (24) hours per day, three hundred sixty-five (365) days per year. First, Landlord, in its reasonable discretion, shall make a determination of the number of hours (Tenant's Hours of Operation) that each of the tenants occupying the Building have utilized their respective space during the calendar year. Any space that is occupied for only a portion of a calendar quarter shall be prorated on the basis of the actual number of days in such calendar year. Second, Landlord shall assign each tenant in the Building an operations constant (Tenant's Operating Constant) that is equal to a fraction where the numerator is the Tenant's Hours of Operation and the denominator is equal to two thousand eight hundred ten (2,810) hours (Standard Operating Hours). Third, Landlord shall adjust the rentable square feet allocated to each tenant (individually referred to as Tenant's Adjusted Rentable Square Feet) in the Building by multiplying the Tenant's Operating Constant assigned to the tenant for that calendar year by the Tenant's Rentable Square Feet. Fourth, Landlord shall determine the adjusted rentable square feet in the Building (Adjusted Rentable Square Feet in the Building) for that particular calendar year by adding up the Tenant's Adjusted Rentable Square Feet for each of the tenant's occupying space in the Building. Landlord shall have the right to further adjust the Tenant's Adjusted Rentable Square Feet in the event a tenant occupying the Building operates in such a manner that causes a disproportionate use of the utilities (and other services comprising the Variable Operating Expenses) by that tenant as compared to other tenants in the Building, resulting in a higher cost for such utilities (and other services comprising the Variable Operating Expenses) on a per-hour basis for such tenant's space. By way of illustration, such disproportionate use of the utilities (and other services comprising the Variable Operating Expenses) could be caused by uses including, but not limited to, more computers than would be used by a general office, more electrical equipment than would be used by a general office, or more people than would occupy a general office. The Base Rent due for the first full calendar month during the Lease Term for which Rent is owed shall be paid to Landlord by Tenant contemporaneously with Tenant's and Landlord's execution hereof. The following Riders are attached to and made a part of this Lease: Rider No. 1 - Work Letter; Rider No. 2 - Option to Renew Lease; Rider No. 3 - Right of First Offer to Lease. Tenant shall be entitled to use up to ____________ (____) unreserved parking spaces, of which eleven (11) shall be reserved and covered, at no charge throughout the Lease Term. Additionally, Tenant shall have the right to request that Landlord cover a portion of the parking spaces Tenant is entitled to use, at Tenant's sole cost and expense, in a manner and location to be approved by Landlord. Landlord agrees that, other than the cost of constructing the covering as stated above, Tenant shall not be charged for the use of any such covered parking spaces. Section 2.01 Lease of Property for Lease Term. 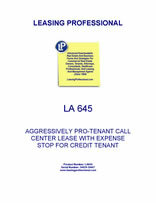 Landlord hereby leases the Premises to Tenant and Tenant leases the Premises from Landlord for the Lease Term. The Lease Term is for the period stated in Section 1.01(n) above and shall begin and end on the dates specified in Section 1.01(n) above. The Commencement Date shall be the date specified in Section 1.01(e) above for the beginning of the Lease Term.